Despite the grey skies and the steady drizzle, I would not be stopped from eating spring even if I couldn’t exactly enjoy it yet. Once those bundles of just-picked Maryland asparagus and (not exactly local but close enough) North Carolina strawberries were spotted, all inclement weather was forgotten and the market scores were hauled home for a feast to celebrate the season. Though I had been unable to really strategize as I dodged rain drops and chatted with my favorite vendors, once home with a bag of fresh veggies and eggs, a Portobello and Asparagus Quiche seemed the way to go. 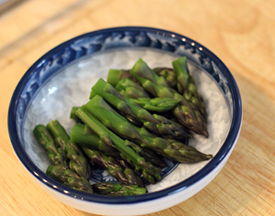 The bright bunch of asparagus was blanched and the tops nipped off before slicing up the rest. The spring onions and the portobello mushrooms were sauteed in a bit of oil and butter, tossed with thyme, mixed with salt and pepper, and left to cool on the back burner. And I went back to my standby savory pastry crust because I love how it puffs up around the edges of the plate. After a freeze and a 15 minute pre-bake of the crust at 450F, I beat 5 eggs with a scant cup of whole milk and a half cup of roughly grated Parmesan (the only cheese in the house, though the combo proved to be quite tasty). Mixed in the cooled veggies and poured it all into the shell. Topped it off with the asparagus tips and popped it back into the oven, temp lowered to 325F. Mine took about 50 minutes to puff up and brown ever so slightly. It was delicious, and the sun even peeked out. Maybe it wanted a bite. Though the strawberries could have been left well enough alone, I did have a stash of almond flour in the freezer and was making a pastry crust already, so whirling up a topping and popping it into the oven seemed like a perfectly reasonable way to finish this late afternoon lunch on a sweet note. Next Post Hippity, Hoppity, Happy Easter! Molly, looks wonderful! You can be my cook anytime. Happy Easter! LOL!